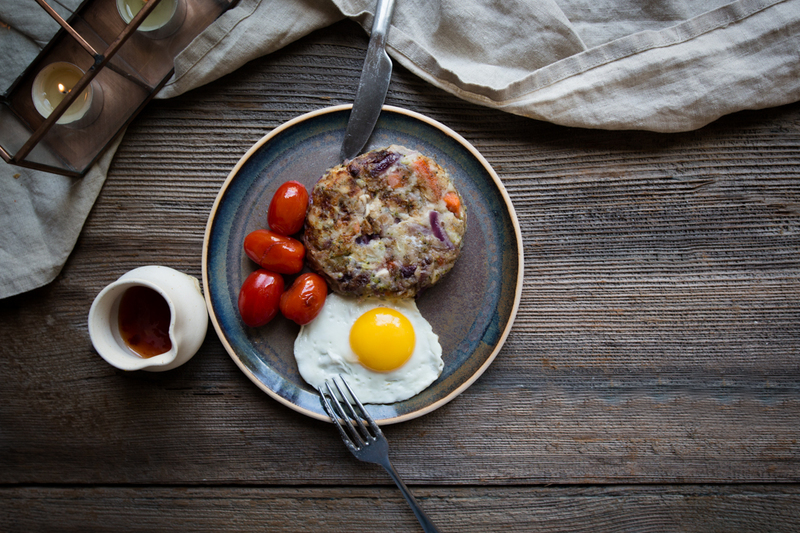 Bubble & Squeak is a Boxing Day must-have in our house and it has been as traditional each Christmas for us as the actual Christmas dinner. I almost look forward to it more. I think it’s the caramelised edges and the fried egg accompaniment that do it for me. 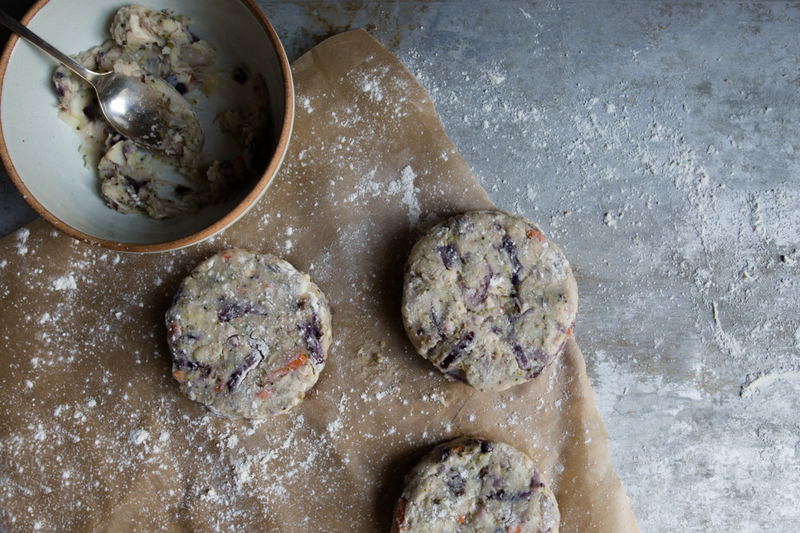 It’s the perfect way of using up leftover mash, sprouts, cabbage, carrots.. well anything goes really. For this year’s recipe I’ve added a new dimension and added red cabbage (cooked with raisins for sweetness) and some mature Cheddar which adds a whole new dimension. 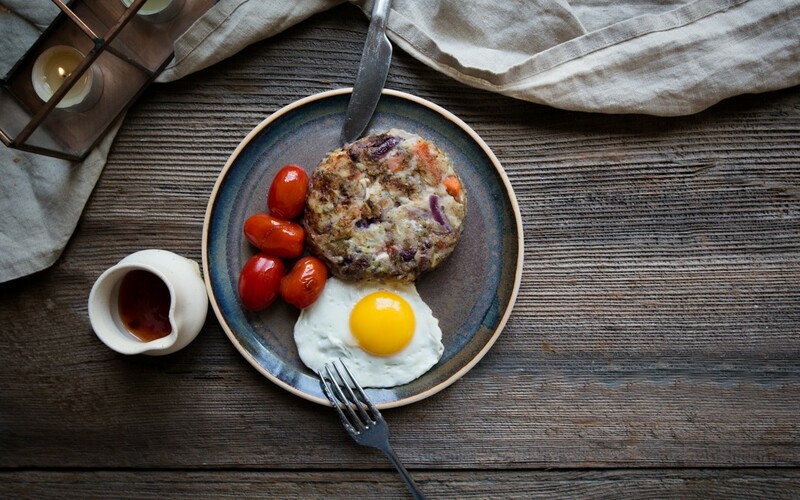 Traditional Bubble and Squeak is the quirky name for fried left-over vegetables, usually from a Sunday lunch. The origins of the name derive from its bubbling and squeaking whilst over the fire. 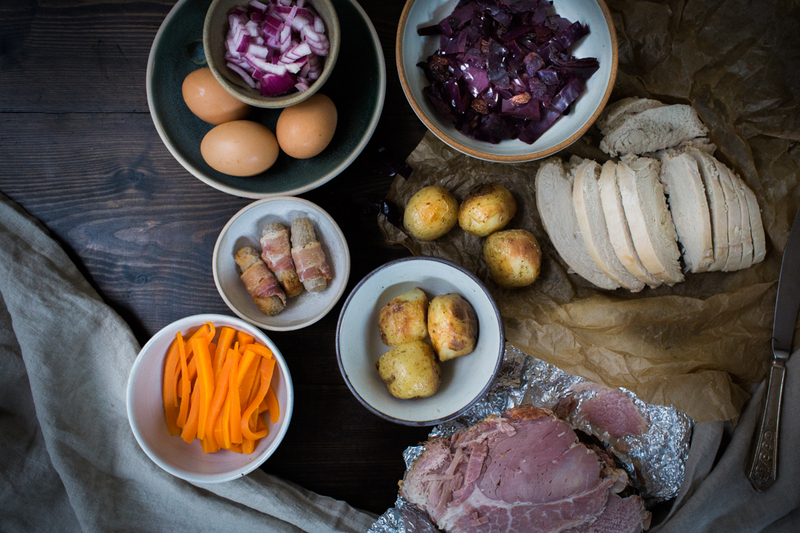 Traditionally the Bubble and Squeak will be eaten on a Monday for lunch or dinner, sometimes with a fried egg on top, bacon/ham/turkey on the side, or meat leftover from lunch the day before. Equally you could just keep it vegetarian. One important factor is mashed potatoes. The potato is the “glue” holding all the other vegetables together. You could equally mash the roast potatoes or cook up some mashed potatoes, it really is that simple. Leftover mashed potato (or mashed roast potatoes). The potato needs to be 50% of the quantity. 1. In a large frying pan melt the butter, make sure it doesn't brown. Add the finely chopped onion and fry gently for about 3 mins or until soft and translucent. 2.Turn the heat up ever so slightly and add the mashed potato and all of the chopped up leftover vegetables. Fry for at last 10 minutes turning them over continuously in the melted butter ensuring the potato and vegetables are thoroughly reheated. Plus you are also aiming to brown the outside edges of the vegetables but not to burning the bubble and squeak, so occasionally press the mixture onto the pan to brown a little then continue stirring. 3. Press the potato mixture on to the base of the pan with a spatula and leave to cook for 1 min. 4. Flip over and repeat. 5. Serve as mentioned above with either a fried or poached egg on top, or slices of leftover meat. An alternative is to mix the potato and vegetables and form into small patties then fry as above. I just lightly sprinkled them with flour before frying.